Bring the family for a full day of summer adventures at Great Waves Waterpark, located at Cameron Run Regional Park in Alexandria, Virginia. Thrillseekers love our speed slides and waterslides, while little ones play in our interactive splash pad and wading pool. Take the adventure further and body surf in the 17,500 square foot wave pool, or watch the kids climb, slide and bounce in our Paradise Play area. Naturally, we also provide comfy shaded areas where you can order food and take a well-deserved rest. Our daily rates are always reasonable, or buy an Annual Waterpark Pass to visit all five NOVA Parks waterparks all summer long. Waterslides, great food & more! Great Waves offers some of the most unique and fun water attractions in Northern Virginia! Start with the waterslides - five in all. That includes a pair of speed slides in which users climb a dizzying staircase before sliding at high speed into the water below, as well as three waterslides - two open and one covered. Zig zag, twist and curl as the cool water rushes you to the pool below. Of course, the park’s centerpiece is the giant wave pool. Grab a tube, bob and weave in the surf as undulating waves give you an ocean-like experience. For the little ones, our Kids Zone is a great place for you and the kids to cool off while having a great time, and don’t forget about the giant splash pad! Great Waves also offers several other attractions to really make your day memorable. Enjoy pizza and ice cream at the Surfside Pizza and Soft Serve, or lunch and snacks at the Riptide Café. Open Spring through Fall, this colorful beach themed play structure features exciting climbing and play features including triple slides, spiral climbs, pogo bounces, rock wall, spiral slides, mazes, kids conveyors, wobble hoppers and so much more to provide hours of entertainment for kids 3 to 12. Step up to the plate and get ready, because we're bringing the heat at our deluxe batting cages! Choose slow or fast pitch softball, or take a crack at baseballs instead featuring a variety of tough speeds. We’ll provide the bats and helmets, or you can bring your own. Hone your swing alone, or get a group of friends together and see who can get the most hits! This beautifully designed and landscaped course offers many challenging holes and hazards, with lush greens in every direction and nearby fountains. 18-holes of miniature golf fun awaits the whole family! Great Waves offers four great cabanas, a perfect way to enjoy a little personal space. Our tiki hut themed cabanas accommodate a maximum of 8 guests and come complete with shade, deck chairs and tables. Cabana rentals are $50.00 on weekdays and $65.00 on weekends. Prior reservations are required and may be made online. This place is AMAZING don't know why they don't have one in Fairfax!! Such an awesome place. They need to make this place BIGGER!! What a great treasure for the local community and for family and friends visiting during the late spring through fall. Lots to do without breaking your wallet. Easy to access, but get there early as parking can be a challenge some days. The atmosphere was awesome and the attractions was amazing. I loved the water wave pool. Give yourself more time - we stopped in with my grandkids and 2 hours few by - wish we had planned for longer visit. Great Waves Groupon Feedback - 08/13/2015 by Mary C.
Great for kids had a fabulous time there!!! 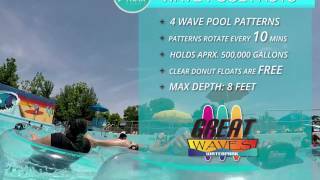 Great Waves Groupon Feedback - 08/06/2015 by LaTika D.
The wave pool is awesome! The wave pool is awesome! There are lots of other water attractions and in addition there is a mini golf course, pavilions available for rent and batting cages. The park has friendly and helpful staff and the life guards are well trained. They constantly scan the water making sure the water is a safe environment for all. I'm looking forward to the pizza stand opening.